The evolution of sexual dichromatism provoked one of the greatest disagreements between Charles Darwin and Alfred Russel Wallace. According to Darwin the main driving force is sexual selection, whereby choosy females prefer showy males, leading to the evolution of conspicuous male plumage. On the other hand, Wallace suggested that dichromatism may arise because nest predation favors more cryptic females. To test the role of natural selection in the evolution of dichromatism we combined quantitative data on differences in parental share in nest attentiveness (representing the strength of natural selection on males vs. females) with spectrophotometric measurements of dichromatism in 412 species of songbirds from 69 families. We expected to find stronger dichromatism in open-nesting species with more divergent parental roles and in body parts exposed during incubation. Dichromatism was not related to the differences in parental share during incubation, but it was most pronounced in lekking species, migrants, and small species. 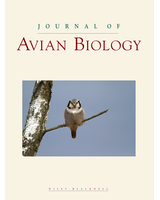 Our results thus suggest that Wallace's hypothesis is not able to explain broad-scale variation in the dichromatism of songbirds, but point to a role for sexual selection, mutual mate choice, and migration strategy in shaping the extraordinary variation in dichromatism exhibited by songbirds.